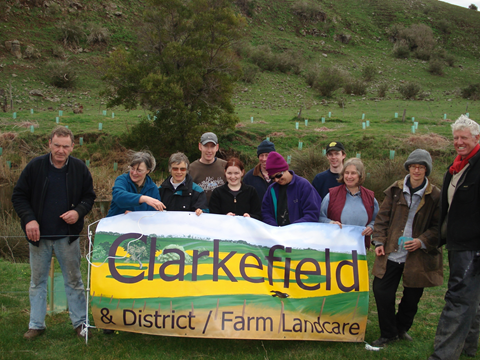 Clarkefield & District Farm / Landcare was formed in 2001. Shortly after, with the aid of a Melbourne Water grant, we initiated a works program on an area of public land adjoining Jacksons Creek at Knox Bridge. From the onset, the project posed many challenges as the area was infested with willows, blackberries and gorse. Any remaining grassland was degraded and the area was the natural place for locals to dump their rubbish. The area is now flourishing with eucalypts, acacias and various native grasses. Over time, we have maintained a weeding, mulching and planting regime at the site which has now become our flagship project. We also run projects on private properties, assisting local landholders with revegetation, weed management and stream frontage management. We meet on the first Tuesday of the month at Clarkefield Pub from February to October at 7pm for a short meeting followed by dinner - Guests are always welcome. You can also visit us at our regular stall at the Riddells Creek Farmer's Market.